Wendy Tokunaga: The Wishing Star (Nozomi no Hoshi) is Here! The Wishing Star (Nozomi no Hoshi) is Here! 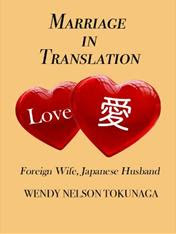 In my new novel, Love in Translation, fledgling singer Celeste Duncan, after receiving a puzzling phone call and a box full of mysterious family heirlooms, is off to Japan to search for a long lost relative who may hold the key to the identity of the father she never new. When Celeste learns to sing a haunting Japanese enka song called “Nozomi no Hoshi (The Wishing Star)” her life changes in ways she never imagined. Now this fictional song is brought to life. My husband, Manabu Tokunaga, wrote and performed the music (and also produced this video!). I co-wrote the lyrics with Hiro Akashi. Hope you enjoy the music video of the theme song for Love in Translation. I love this song! I'm also so glad to have met you at the SFWC. It's hard to find people who love to write AND have a passion for Japanese culture. I look forward to your next book and hope to see you around SF! Yoroshiku Onegaitashimasu! Meghan, so nice of you to post here! Very nice to have met you too. I'm glad you like the song. Best of luck with your writing Gambatte! Hi Wendy... got here after watching the video of the writers singing event at Patricia V. Davis Facebok. This website is very informative. i really really learnt many from you guys. thanks alot and keep the good works comming. Wow, i love it. Very nice to have met you here. And thanks for sharing with us.